Band Camp is mandatory for ALL 2017-2018 marching band members!! What is 1st year band camp? 1st year band camp is designed to prepare incoming ninth-grade students for the marching season. 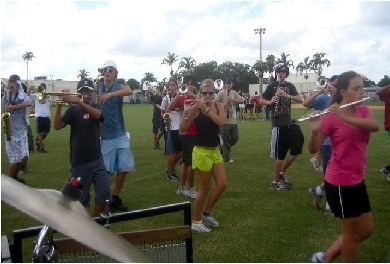 Band camp is an introductory experience to the high school band program and is meant to be FUN!! What does 1st year band camp consist of? The camp consists of learning the basics of marching and maneuvering, rehearsing music through sectionals and combined groups, conditioning, auditions and spirit games.